We are a 501c3 nonprofit actively restoring the trails, history and flora of HerrontownWoods. Our goal is to honor the extraordinary legacy of Oswald and Elizabeth Veblen, who left this first Princeton nature preserve, their house, cottage and farmstead in the public trust. 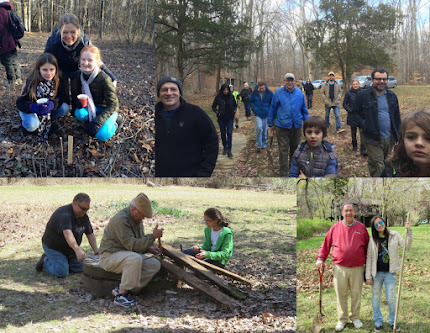 HISTORY: The Friends of Herrontown Woods (FOHW) began in the summer of 2013 as an informal group that came together to clear trails long blocked by fallen trees and invasive growth in Herrontown Woods. One year later, trails on more than 200 acres were once again accessible to the public. Kurt Tazelaar and Sally Curtis were given a Sustainability Leadership Award for their work to reopen the trails. In October, 2014, FOHW received official 501(c)(3) status from the IRS, and is restoring habitat, partnering with neighboring institutions, and has begun the process to acquire the Veblen House, cottage and farmstead. Donate with a credit card or PayPal account at this link, or send a check made out to "FOHW" to 139 N. Harrison St, Princeton, NJ 08540. Donations of any amount are greatly appreciated, and will support our historical restoration and ecological stewardship initiatives. Section 1. The name of this Association shall be "Friends of Herrontown Wood" for official corporate purposes and "FOHW" for all ordinary business and promotional purposes. In this document it is hereinafter referred to as “the Association." Section 2. The Association is and shall remain a non-profit corporation organized under the laws of the State of New Jersey. Its "articles of organization" comprise the articles of incorporation and these bylaws as from time to time amended. To promote public education through events drawing from and building upon the multifaceted legacies of previous owners: the Veblens and Whiton-Stuarts. To partner with other local, state, and national agencies and organizations to achieve these and other charitable, educational, and scientific goals.